President Donald Trump is promising major changes on climate and energy policy, including efforts to increase production from fossil fuel energy sources such as coal. But a new Pew Research Center survey finds that 65% of Americans give priority to developing alternative energy sources, compared with 27% who would emphasize expanded production of fossil fuel sources. Support for concentrating on alternative energy is up slightly since December 2014. 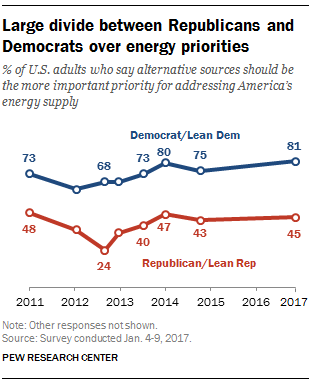 At that time, 60% said developing alternative energy sources was the more important priority. There continue to be wide political differences on energy priorities. While a 2016 Pew Research Center survey found large majorities of Democrats and Republicans supported expanding both wind and solar energy, the new survey shows that Democrats remain far more likely than Republicans to stress that developing alternative energy should take priority over developing fossil fuel sources. About eight-in-ten (81%) Democrats and independents who lean to the Democratic Party favor developing alternative sources instead of expanding production from fossil fuel sources. Republicans and Republican-leaning independents are closely divided: 45% say the more important priority should be developing alternative sources, while 44% say expanding production of oil, coal and natural gas should be given more priority. There is an ideological divide in these views within the GOP. 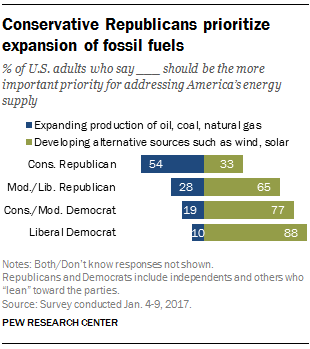 Among moderate and liberal Republicans and Republican leaners — who account for 36% of all Republicans and Republican leaners sampled – 65% prioritize developing alternative energy sources, compared with fewer (28%) who prioritize expanding production from fossil fuel sources. By contrast, conservative Republicans back the expansion of fossil fuels over developing alternative energy sources by a margin of 54% to 33%. Large majorities of both liberal Democrats (88%) and conservative and moderate Democrats (77%) prioritize alternative sources. Political differences over energy priorities are broadly in keeping with polarized views on a wide range of climate and energy issues. For example, Pew Research Center has found that 88% of liberal Democrats and Democratic leaners say climate change is a major threat to the well-being of the United States, compared with just 12% of conservative Republicans and Republican leaners. There also are differences in public priorities about energy by age. Americans under the age of 50 are especially likely to support alternative energy sources over expanding fossil fuels. 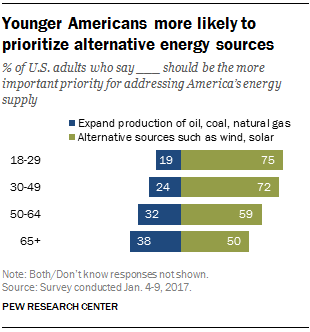 About seven-in-ten (73%) of those ages 18 to 49 say developing alternative sources of energy should be the more important priority, while 22% say expanding production of fossil fuels should be the more important priority. Older adults are more divided in their views, though they also give more priority to alternatives. 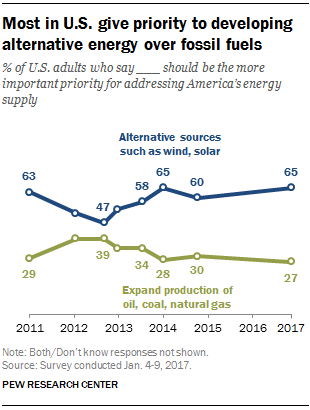 Among those 50 and older, 55% say alternative energy development is more important, while 34% say it’s more important to expand production of fossil fuel energy sources. Note: These findings are based on a Pew Research Center survey conducted Jan. 4-9, 2017 with a nationally representative sample of 1,502 U.S. adults. The full methodology can be found here, and the questionnaire wording and topline are here (PDF).